Swim over colorful coral formations with turtles, rays, and fish when you go snorkeling at Colombia Reef, one of the most popular things to do in Cozumel. Sea turtles. Southern Stingrays. Colorful coral formations. Zillions of fish. Perfect for beginners, Cozumel’s Colombia Reef is an exceptional snorkeling destination. Sign up for one of our snorkeling tours to discover this unique natural attraction. Discover an underwater paradise rich in marine life when you go snorkeling at Colombia Reef. 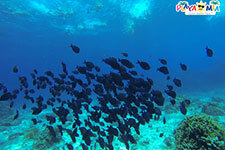 It’s an ideal destination for snorkeling beginners. You’ll be amazed at the diversity and color of the animal life that you encounter amidst the multicolored coral. Lobsters, crabs, rays, fish, and sea turtles all call this area home. With crystal-clear waters and an abundance of marine animals, our Caribbean island is known as one of the top snorkeling and scuba diving destinations on the planet. Currents are mild, making it easy to swim and explore. Drift snorkeling is also popular here, which means that you can cover a larger area without backtracking and having to swim back to the boat. What’s the Best Way to Go Snorkeling? Book one of our Cozumel Snorkel Tours to Colombia Reef and we’ll take care of everything. Our snorkeling packages include full gear rentals along with expert instruction and guidance from a PADI-certified Dive master. Follow along as your guide points out the incredible sea creatures and coral formations – you won’t miss a thing. After your snorkeling adventure, grab a cold drink on board the boat and return to our amazing beach and water park for a full international buffet. 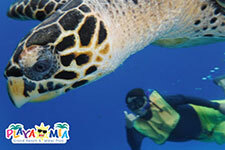 Would you like to learn more about our snorkeling tours, or about other things to do in Cozumel’s biggest beach park? Please contact us today to plan your next vacation.